Three Reasons to Have Your Company's Carpets Cleaned Professionally ... ASAP! Health - Did you know your carpet is a big air filter? It is. Carpets trap airborne particles and hold them there making indoor air cleaner. However a filter can only hold so much before it stops working. In fact, walking across a dirty carpet actually releases some of the trapped particles resulting in airborne particles. Yuck! 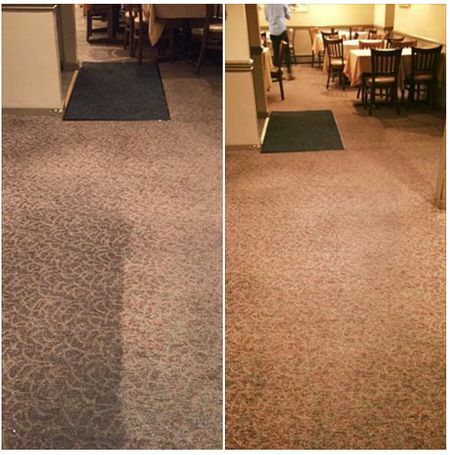 That is why it is important to vacuum carpets regularly and perform a professional carpet cleaning every 1-6 months depending on foot traffic. Happiness - You see the carpet needs professional cleaning. Employees and customers see it too. Its on your to do list. Don't procrastinate any longer. It needs to be done. So pick up the phone and make an appointment. A clean carpet and another thing off the To-Do list would make anyone happy! Money - Customers vote with their dollars and they would rather visit a clean establishment. Successful businesses are clean businesses. Period. Second, a clean carpet filters the air improving indoor air quality. A healthy work environment promotes a happier and more productive work environment. Lastly, would you rub sand paper on your carpet? Of course not. But once sand and dirt are in a carpet, simply walking on the carpet damages the fibers just like sand paper would. The result is frayed fibers and a prematurely worn carpet that will become a significant expense sooner rather than later. Protect your business. Vacuum that carpet daily and deep clean it regularly.